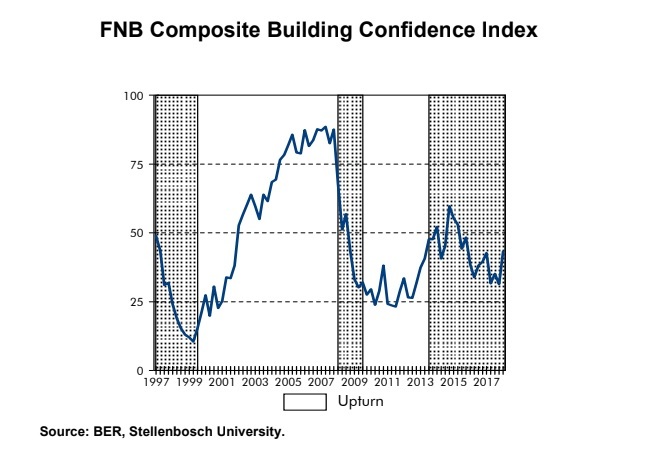 The FNB/BER Building Confidence Index rose to 43 in 1Q2018, from 31 in 4Q2017. All but one out of the six sub-sectors registered higher confidence, namely quantity surveyors. Higher activity, most notably among non-residential main contractors, and improved business conditions lifted confidence. In sum, growth the building sector likely started the year off on a stable footing. After falling to 31 in 4Q2017, the FNB/BER Building Confidence Index gained 12 points to register a level of 43 in 1Q2018. 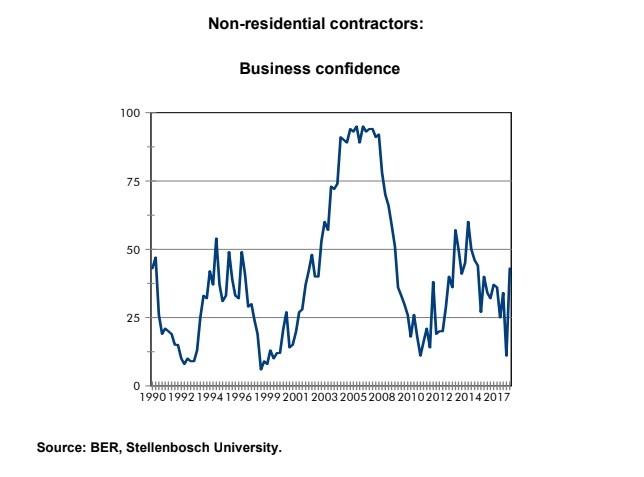 “Of importance was the broad-based nature of the improvement, with all of the sub-sectors barring quantity surveyors reporting higher confidence,” remarked John Loos, Property economist at FNB. 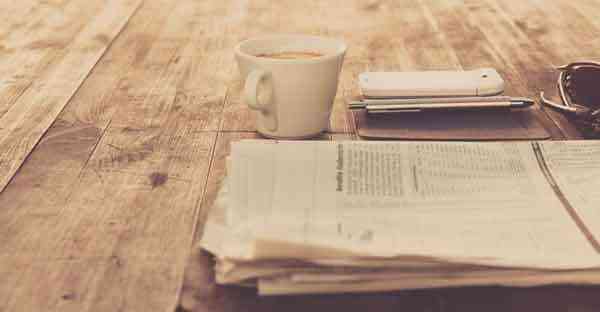 Despite the rise, at the current level, the index indicates that the majority (nearly 60 per cent) of respondents are dissatisfied with prevailing business conditions. Main contractor confidence gained 7 points to register a level of 41 in 1Q2018. The higher confidence was supported by an improvement in building activity, especially in the non-residential sector. According to Loos, “non-residential contractors have under performed noticeably compared to residential contractors over the past few quarters, so this rebound is a positive surprise. However, it comes off a low base and the magnitude of the improvement will be difficult to sustain going forward given the economic fundamentals affecting the sector”. Residential activity was largely unchanged. Therefore, on balance, the survey points to somewhat better overall building activity. The biggest increase in confidence (+29 index points) was among building material manufacturers. “While the higher confidence was supported by better domestic sales and production, it was the export indices – export sales and export order volumes – which provided the biggest lift,” added Loos. However, it is worth noting that the confidence of building material manufacturers is notoriously volatile. Hardware retailer confidence moved higher for the third consecutive quarter to 47. This equates to a cumulative 34 index-point rise since 2Q2017. Sales volumes and orders continued to move higher. However, overall profitability remained relatively weak. “Along with the tangible improvement in sales and orders, hardware retailers also feel that business conditions are noticeably better than this time last year,” commented Loos. “Confidence at the start of the building pipeline was a mixed bag, urging caution with regard to the outlook,” argued Loos. Architect confidence moved higher to 43 index points while the confidence of quantity surveyors shed 7 points to register a level of 31. A similar trend was observed with respect to activity where architects generally reported higher activity while quantity surveyor activity levels remained weak. Sub-contractor confidence increased to 52 in 1Q2018, from 47 in 4Q2017. In conclusion: Building confidence started 2018 on a solid footing, rising to 43 in 1Q2018, from 31 in 4Q2017. 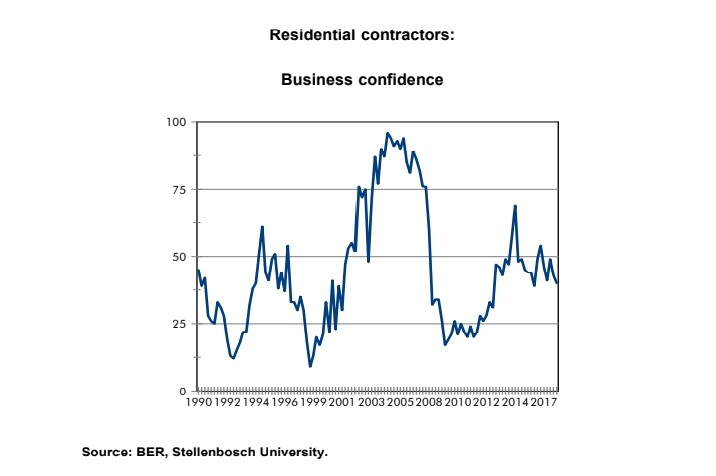 The higher confidence is supported by the underlying activity indices with the sharp improvement in non-residential main contractor activity being the most encouraging. This, along with residential activity which was largely flat and higher sales for manufacturers and retailers, could see overall building sector output improve in 1Q2018. 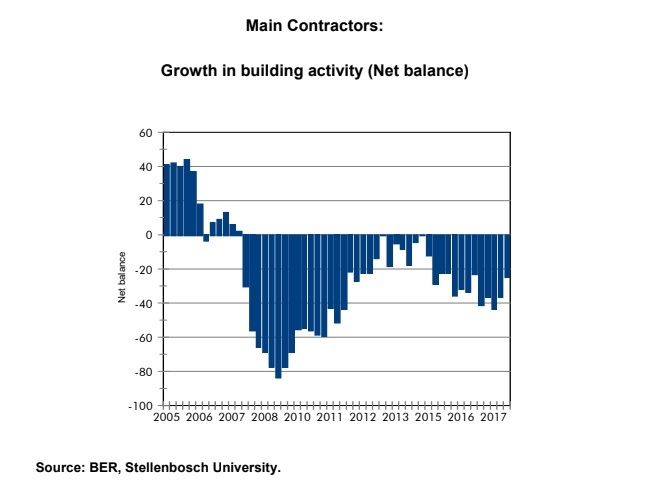 Regarding the outlook, Loos warned that: “It is uncertain what has lifted non-residential activity so significantly this quarter, therefore it should be interpreted with caution. The building pipeline has not improved and general economic conditions continue to point to lacklustre (albeit higher than in the recent past) GDP growth. This is important as the non-residential sector typically lags growth in other sectors”. The FNB/BER building confidence index can vary between zero (indicating an extreme lack of confidence) and 100 (indicating extreme confidence). It reveals the percentage of respondents that are satisfied with prevailing business conditions in six sectors, namely architects, quantity surveyors, main contractors, sub-contractors (plumbers, electricians, carpenters and shop fitters), manufacturers of building materials (cement, bricks and glass) and retailers of building material and hardware. In contrast to the RMB/BER BCI, which includes only main contractors, the FNB/BER building confidence index covers the whole pipeline, from planning (represented by the architects and quantity surveyors), renovations, additions, owner builders, the informal sector (represented by building material and hardware retailers) and production (manufacturers of building materials) to the actual erection of buildings by main contractors and sub-contractors. The fieldwork for the first quarter survey was conducted between 29 January and 6 March 2018.